Son of Moses Gwinn (Born-1774) & Elizabeth Wilson. 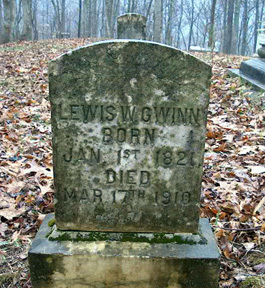 Died at his home at Meadow Creek, this county, March 17th, 1910, Lewis W. Gwinn, of la grippe and the infirmaties of old age. Uncle Lewis, as he was familiarly called, was born Jan, 27th, 1821, and was therefore 89 years, one month and 20 days old. He lived all his long life where he was born - a little over 89 years ago. There are few men, if any, that ever lived so long that had as few difficulties with his fellow man. He was a man of strict integrity, honest, truthful and upright in all his dealings with his fellow man, and if he ever misrepresented anything intentionally, no one at this time remembers it. He was not a member of any church, but he lived an exemplary life and was heard to say sometime before he died that he was living the very best life he knew how, and was willing to leave all else to the Lord. He was twice married; was the father of twelve children, seven of whom, with his wife, survive him. Deceased was also an uncle of A. G. and R. R. Flanagan and Joseph and William Hinton, of Hinton. After funeral services from his home, conducted by Rev. D. G. Richmond, of the (Meadow Creek) Missionary Baptist church, his remains were laid to rest in the Gwinn cemetery, near Meadow Creek Station in the presents of a large gathering of relatives and friends. I know of no one who was more universally respected and loved than was Uncle Lewis Gwinn. A precious one from us is gone. A voice we loved is stilled. A place is vacant in our home,, which never can be filled. 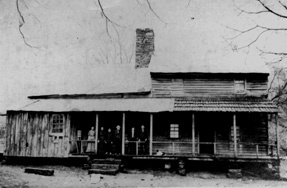 Lewis W. Gwinn home place. Thought to have been built by Lewis and Williams father, Moses Gwinn. Lewis was two years old when his father Moses died in 1823. Moses is buried in the Gwinn Cemetery at Green Sulphur Springs, WV, near his father Samuel Gwinn.